In this unit, students will work in teams to design a vehicle that can carry a box of paper clips and roll down a ramp. They will construct their vehicle using items recycled from their lunch! Before they start solving a problem, engineers first study the problem. The problem in our case is how to manage friction. 1 cardboard box top "ramp"
Apply the various tapes to your box top. These will be the test surfaces. Create a table on your paper. Each row should be a type of tape (and cardboard for control) and the column should be "Angle"
Place paper clip box on a surface of the cardboard. Raise the angle until the box starts to slide. 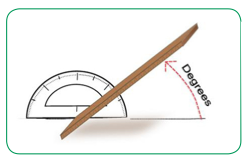 Record the angle measured by the protractor. Repeat steps 3-5 for each material/type of tape. What does the angle at which the slide started tell you about the friction? Which material was the stickiest? Which was the least sticky? What different material might you use to make something slide slower? Faster? Students for hypotheses about the differences they may see between sliding friction and rolling friction. Prepare a "clipmobile." 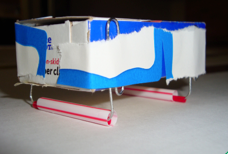 Tape paperclips to the sides of the paper clip box and create rollers with the coffee stirrers. Place the clipmobile on the ramp and record the angle at which it starts to roll. Test the effect of different friction materials and record the results. Test the effect of different size straws and record the results. How different were the results from rolling on different surfaces? Was the difference bigger or smaller than with sliding? What did you notice about different size straws? Day 3 & 4: Design a rolling car! Work with your group to design a vehicle based on what we've learned. Draw your design. Test it on the BIG RAMP. Reflect on how well your car functioned. Did the wheels roll? How fast? What can you do to make it work better? Repeat your process to make the best car possible! Answer the reflection questions about this project.